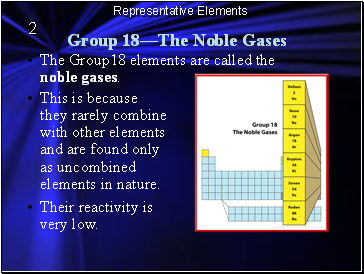 The Group18 elements are called the noble gases. This is because they rarely combine with other elements and are found only as uncombined elements in nature. Their reactivity is very low. 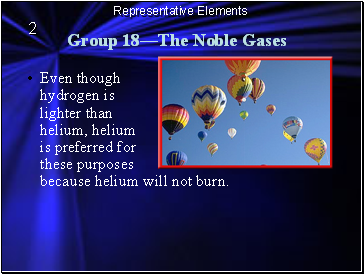 Helium is less dense than air, so it’s great for all kinds of balloons. 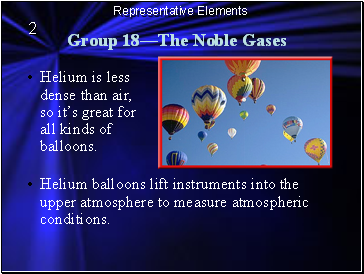 Helium balloons lift instruments into the upper atmosphere to measure atmospheric conditions. 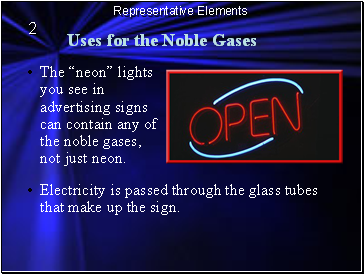 The “neon” lights you see in advertising signs can contain any of the noble gases, not just neon. Electricity is passed through the glass tubes that make up the sign. The electricity causes the gas to glow. 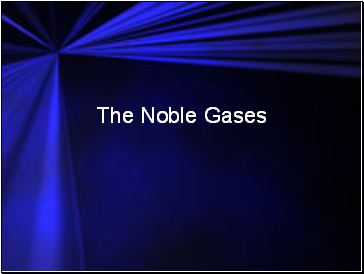 Each noble gas produces a unique color. 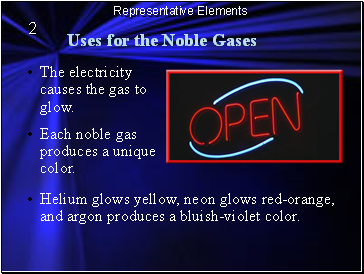 Helium glows yellow, neon glows red-orange, and argon produces a bluish-violet color. 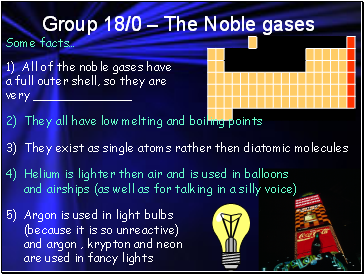 Argon, the most abundant of the noble gases on Earth, was first found in 1894. 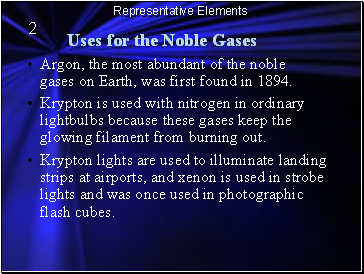 Krypton is used with nitrogen in ordinary lightbulbs because these gases keep the glowing filament from burning out. Krypton lights are used to illuminate landing strips at airports, and xenon is used in strobe lights and was once used in photographic flash cubes. 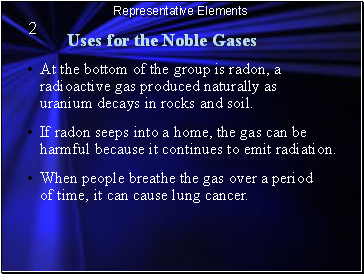 At the bottom of the group is radon, a radioactive gas produced naturally as uranium decays in rocks and soil. If radon seeps into a home, the gas can be harmful because it continues to emit radiation. When people breathe the gas over a period of time, it can cause lung cancer.